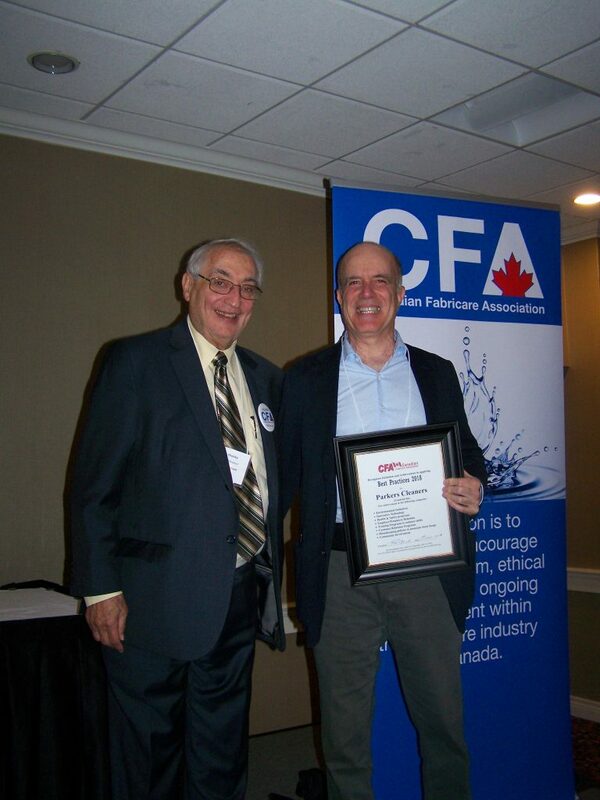 We Won a Canadian Fabricare Association Award! We try not to spend too much time boasting about ourselves on this blog, but today, we make an exception! We are thrilled to announce that we received the Best Practices Award from The Canadian Fabricare Association in the following categories: environmental initiatives, innovative technology, health and safety programs, employer/employee relations, training programs to enhance skills, customer relations programs, housekeeping policies to maintain a clean image, and community involvement. While it’s always nice to be recognized, we are especially proud of this achievement because it highlights some of our most important priorities at Parkers. We figured that this award was a good chance for us to draw your attention to a couple of the ways that we go the extra mile. If you’ve been reading our blog or are already a customer, you’ll know that reducing the impact we have on the environment is a major value of ours. We do simple things like recycle plastic and hangers, but we also supply our customers with reusable bags for both dry cleaning and folded laundry. These reusable bags keep the finished clothing clean until you get home, but then can be reused to hold dirty clothing that needs to come back to the cleaners. We rewash these bags after each use. Our stores use high efficiency, and low electrical usage, LED lights for both inside and outside sign lights as well. For the actual clothing care, we reuse heated water from the cleaning process to provide steam for pressing and we recycle water for cooling our facility. We also use three cleaning methods that are kind to the environment: wet cleaning, Solvair (which uses reused CO₂) and Intense solvent. And because we know that clothing care still does have an impact on the environment despite these efforts, we make a contribution to the Carbon Fund for every wedding gown that we clean. Technology is continually improving the ways that we clean clothing effectively and efficiently. We have adopted some incredible new technology, like the Solvair system, to keep up with these changes and offer our customers the best cleaning experience possible. New solvents, like Intense, and new equipment to enable water recycling are also ways that we bring innovation into our business. Just in case you’re curious about how we do in these other categories, we thought we’d share some quick extras. Along with conforming to guidelines for health and safety, we offer our employees extra health benefits. We also take great pride providing our customers with information and savings through our website, blog, and monthly newsletters. Our 1-800 number allows customers to call us toll-free and our pick up and delivery service is provided at no extra charge. Because we want you to have a positive experience the moment you walk through our doors, we upgrade our stores regularly to stay current. Most importantly, we donate to local organizations and perform some gratis cleaning to contribute to the communities that we are grateful to be a part of. Hopefully this gave you a sneak peek into our values at Parkers Custom Clothing Care! We want you to know that we appreciate you choosing to give us your business and that we are doing our best to be a company that you can feel proud to support. Get your laundry and dry cleaning picked up and returned to you fresh and clean! Get exclusive discounts news and insights from the Parkers team. I agree to receive occasional emails from Parkers (which I can unsubscribe from at any time). Looking to speak with one of our clothing care specialists? Sign up to receive monthly discounts and specials.